Click to view the A&BC Chewing Gum Central reference page. 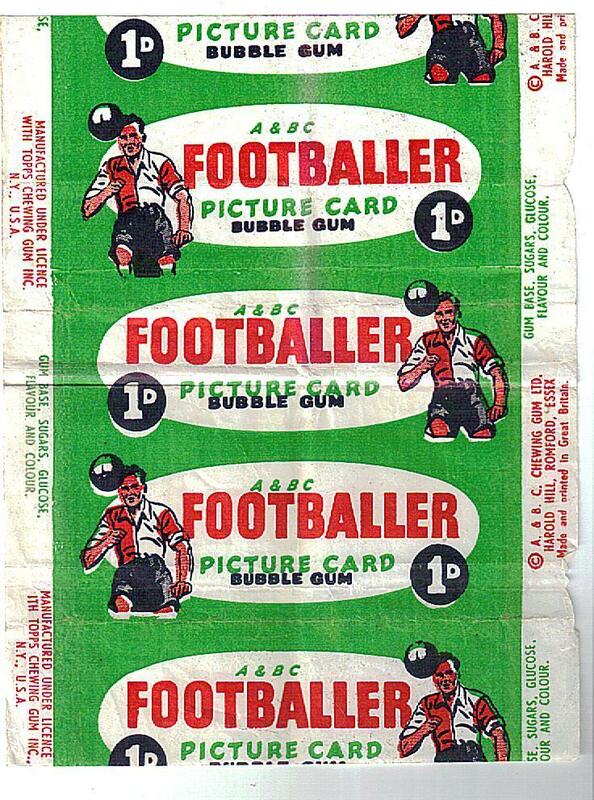 A&BC Chewing Gum hold a special place in the history of football card production, producing a stunning array of high quality cards over a long period of time. The level of interest in these cards has led to this website displaying all of A&BC's football related output, dating back to 1954. 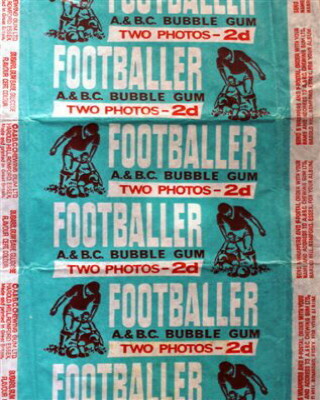 A special 6-part history of A&BC Chewing Gum has been produced by this website. Click to begin Part 1. 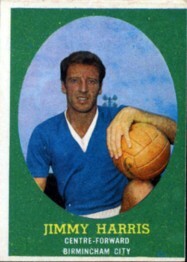 To view A&BC Scottish football cards click here. A set of 120 black and white photograph cards with plain backs. 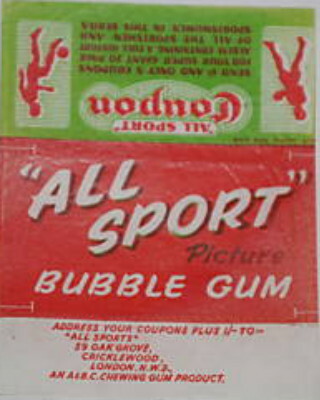 The chewing gum was issued in a wrapper which said 'All Sport, Picture Bubble Gum'. 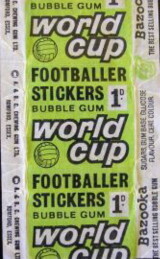 There was a coupon on the wrapper which you could use to send away with 1/- to 'All Sports", 59 Oak Grove, Cricklewood, London, NW3. 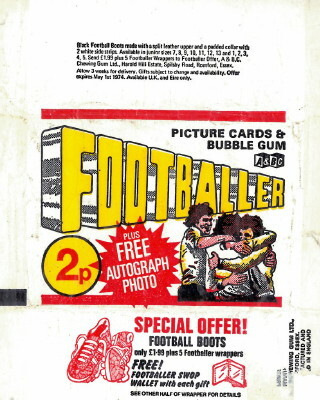 The coupons could be used to acquire an album 'Send 1/- and only 5 coupons for your super giant 20 page album containing a full history of all the sportsmen and sportswomen in this series'. 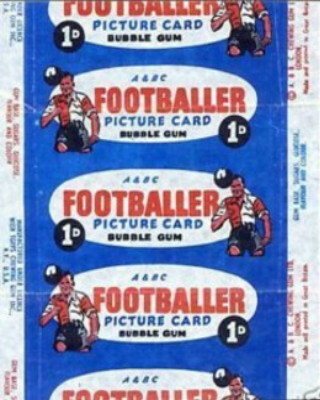 A&BC Chewing Gum's first dedicated football card sets. There are two series of these cards, numbers 1 to 46 and 47 to 92, but no known checklist cards. For Series 1 there are two versions of the set, commonly referred to as 'Planet', due to an offer printed at the top of some of the cards. In Series 1, the 'Planet' cards have black and red backs, while the non-Planet cards have blue and red backs. Interestingly, there are also two different card printing sizes for the Series 1 non-Planet cards, with some cards slightly larger and with a larger printed image than other cards in the set. Click here for a discussion and images of the card size variations. All cards in Series 2 have, or originally had, the Planet offer at the top and therefore have black and red backs. The text of the offer is 'Send your name and address with 1/- P.O. 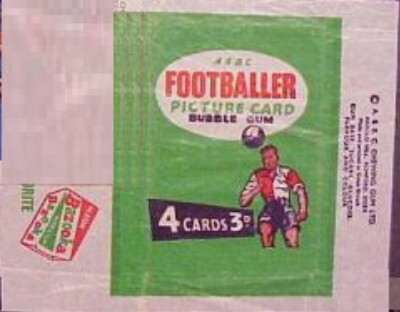 for 32 page FOOTBALL ALBUM to PLANET LTD., 50 Hampstead Road, N.W. 1. The wrapper has text which states 'Send 1 wrapper and 1/- P.O for your TOPSTAR ALBUM'. Write your name and address on separate paper. 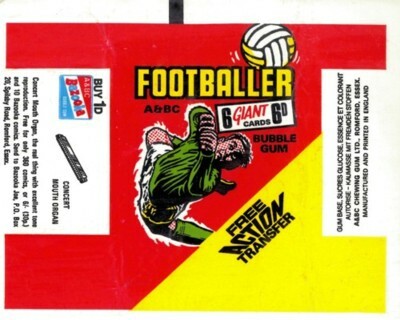 The address on the wrapper is A&BC Chewing Gum Ltd., London N.W. 9. Click to view the Topstars Album of Famous Footballers. A set of 98 red backed cards issued in two series, First Series (1 to 49) and Second Series (50 to 98). 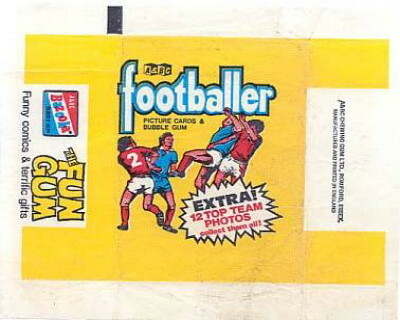 The backs have a 'Football Quiz', which is how this set is often referenced. The checklist cards are numbers 49 and 98. There were two wrappers for this set. One card for 1d, or four cards for 3d. There are two known shop display posters for this set, one for each of the Series. 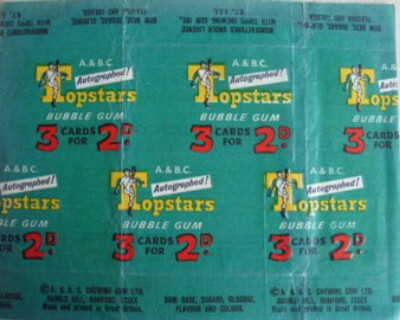 The wrappers do not have an album offer, but state 'Manufactured under licence with Topps Chewing Gum Inc., N.Y., U.S.A.'. 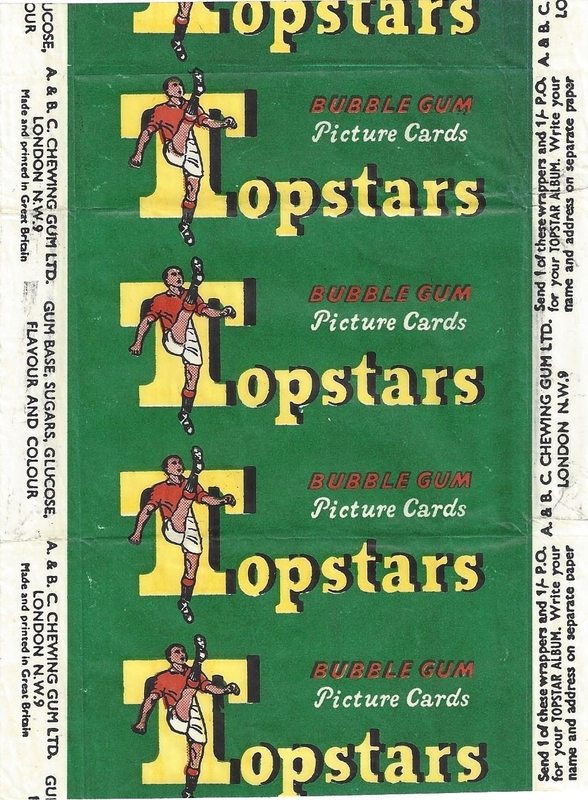 This ties in with the A&BC history which reports that Topps bought in to A&BC in 1959 (see A&BC Chewing Gum history Part 2). 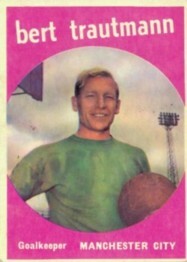 A set of 84 cards issued in two series, Series 1 (1 to 42) and Series 2 (43 to 84). The checklist cards are numbers 42 and 84. The Shop Poster header shown above relates to this set of cards, and has the A&BC address as Romford, Essex, indicating that A&BC had moved from London following the fire at their Colindale factory. The cards were available for 1d and 3d, one card for 1d or four cards for 3d (plus a piece of gum). The wrappers state 'Send 5 wrappers and 1/- postal order with your name and address to A.& B.C. Chewing Gum Ltd., Harold Hill, Romford, Essex for your album'. A set of black and white photograph cards with signatures printed over the photos, plain backs. I'm fairly certain that this set was issued as a single series of 64 cards. There are no known checklist cards for this set. It is not clear whether or not there was a one card for 1d wrapper available for this set. There are no known shop display posters for this set. An attractive set of 80 cards plus two checklists, repeating the 'colour-framed' style from the 1960/61 black backs. I suspect that this was issued as as a single series. There are two checklist cards, numbered 81 and 82, but they both list the same cards numbered 1 to 80. 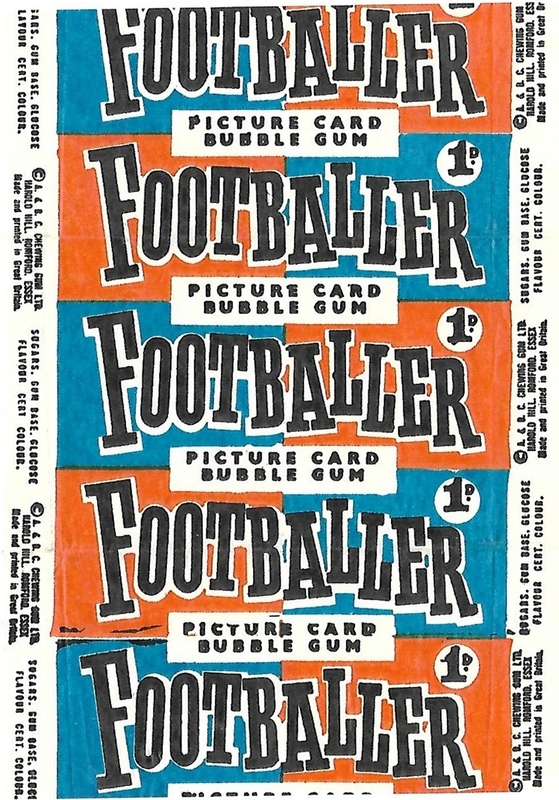 While it is thought that there may be one or two wrappers for this set (one card for 1d and three cards for 2d) there are few known images of these wrappers, making them extremely rare. Issued in two series, Series 1 (1 to 55) and Series 2 (56 to 110).The shop display poster header above is from a poster which features mainly Series One cards. Two versions of the wrapper are known: 1 card for 1d. and 3 cards for 2d. This set may originally have been designed as a set of 105 cards. 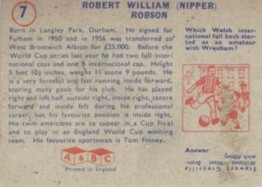 There is a checklist card number 105 which lists cards to 105, replaced by a later checklist card number 110 with the label 'English Series No. 2 revised'. A&BC continue to grow the size of the sets, this time issuing the cards in three series, Series 1 (1 to 58), Series 2 (59 to 103) and Series 3 (104 to 149). 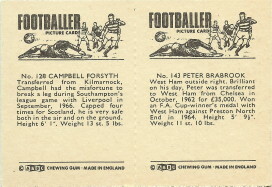 A set of 220 black and white cards in two series (1-110 and 111-220) issued in pairs, but most often seen as singles. 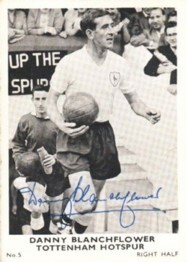 The 2nd series differs in that the player name is printed on the front of the card. 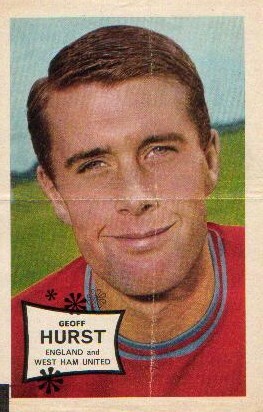 There are 8 checklist cards for the 1st series, all being parts of a picture of the 1966 England World Cup Winning Team. The 8 checklists from the 2nd series form a picture of the runners-up - West Germany. The sets must have been produced in September 1966, since they include details of transfers which occurred early in the 1966/67 season e.g. 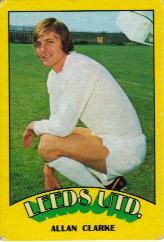 Card 95 Colin Dobson but not October transfers e.g. 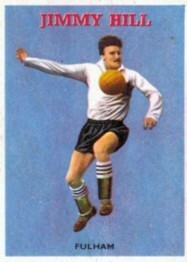 Card 177 Dominic Sharkey. 50 stickers/stamps sold by A&BC. These are very, very rare. For the price of 1d. you received a piece of bubble gum, plus one sticker. Some stamps depict players (vertical), while others depict players and their teams (horizontal). Many thanks to one particular website visitor who contributed most of these images. Promotional badges. 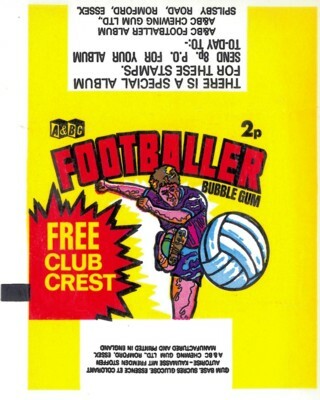 These badges include the text 'Featured in A&BC's Footballer Bubble Gum'. 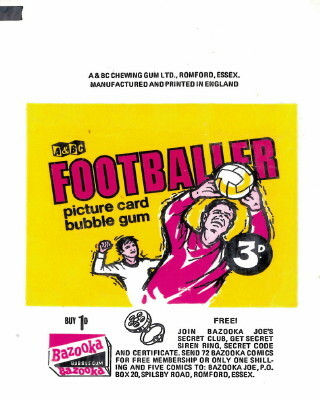 Douglas Coakley, one of original founders of A&BC Chewing Gum, tells me that the badges were produced as promotional items to giveaway at sales and marketing events to promote the bubble gum packs and football cards. 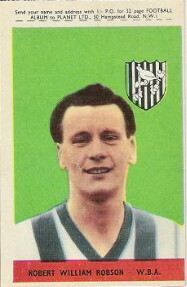 He can't recall the exact dates, but the featured players strongly suggest the 1966 World Cup Squad. Originally throw-away items, these badges are now very collectable. They are surprisingly small, being 18mm or 0.7" diameter. A small set of colourful cards, sometimes referred to as 'Black backs'. No checklist cards. 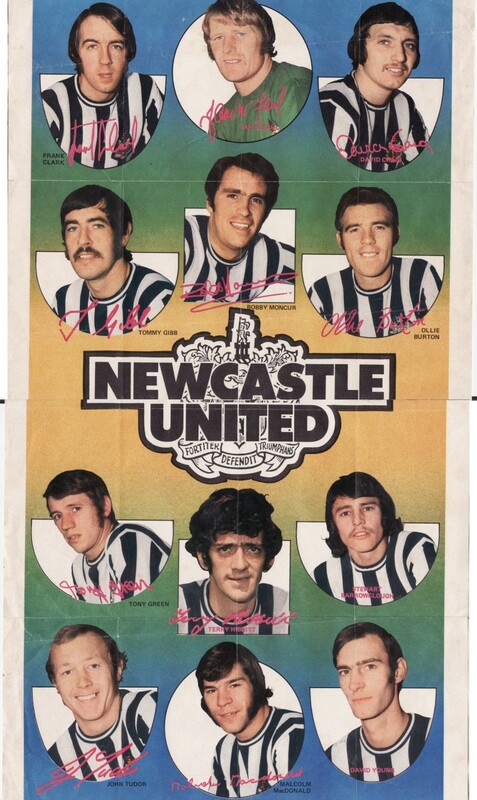 An attractive set of 'pin-up' posters given away in the packets of Star Players. 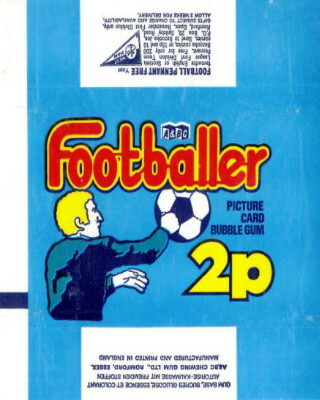 Since these pin-ups were squeezed into the bubble gum packets they always have the creases. 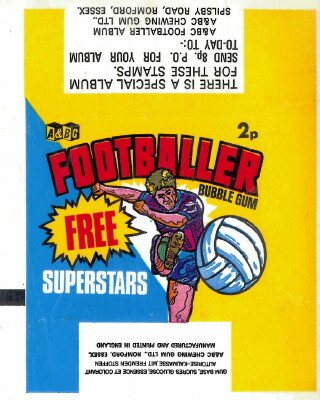 My own all-time favourite set of football cards. A neat, classy set with a Football Quiz and Magic Answer on the back. Series 1 comprises cards 1 to 54 (Checklist is card 1), and Series 2 comprises cards 55 to 101 (Checklist card 55). Team pennants folded in the yellow back card packets, hence the folds whenever you see these attractive pennants. The pennants have instructions to 'Cut out Pennant along black line' but thankfully not too many boys seem to have done this. 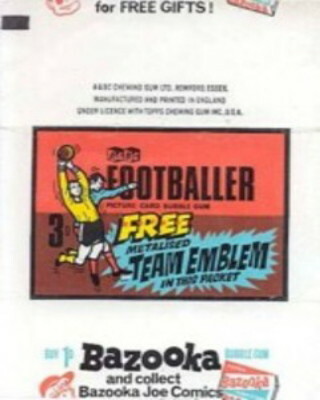 They were issued with Series 1 of the Yellow Backs in 1968. These shiny cards don't scan too well. 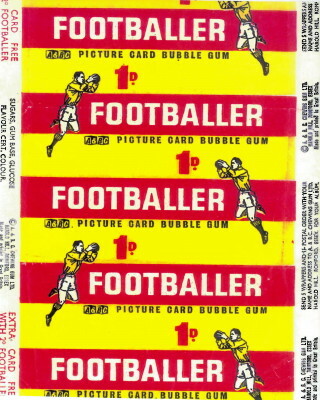 They were issued with Series 2 of the Yellow Backs in 1968. Another popular A&BC set. 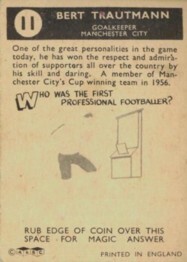 The backs included a Football Facts quiz. Series 1 comprises cards 1 to 64, Series 2 cards 65 to 117 and Series 3 cards 117 to 170. The 3 checklist cards are unnumbered. 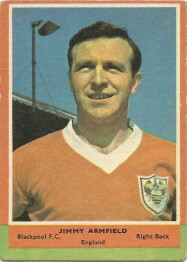 Two players (Lawrence and Woodfield) have card number 117. Crinkle-cut photographs. Attractive black and white photograph cards with a crinkle-cut edge. Numbers 1 to 18 were issued with Series 2 of the Green Backs. Numbers 19 to 36 were issued with Series 3. World Cup Posters. A super set of posters. 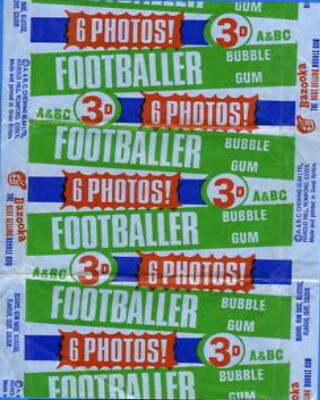 You bought the posters through buying the bubble gum packets (6d each). 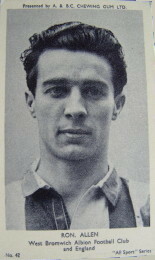 The player photographs (see below) came for free with the posters. 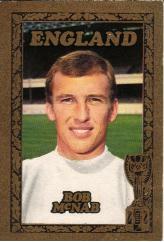 Super attractive cards for the 1970 England World Cup Squad. Available in two forms - with or without an embossed Jules Rimet trophy. 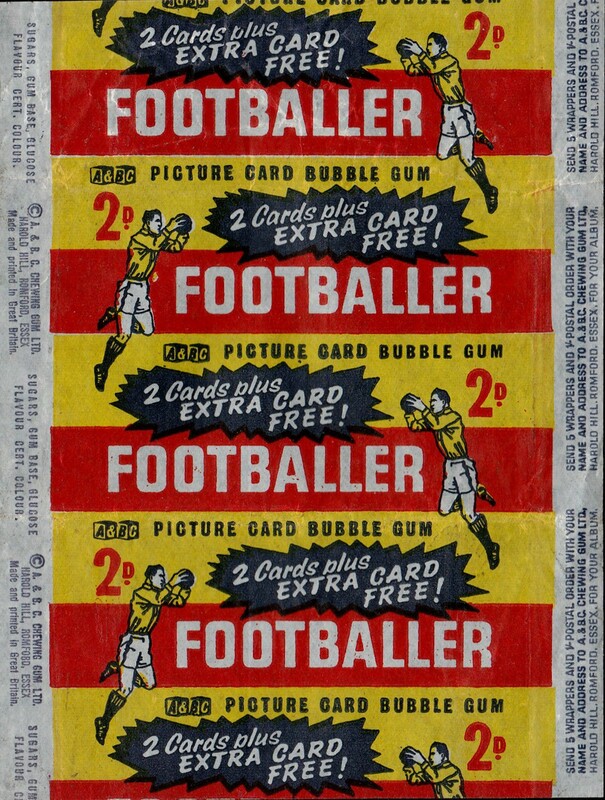 These cards were issued with the World Cup Posters above. A large set of attractive cards, issued in 3 sets. Series 1 comprises cards 1 to 84 (checklist), Series 2 cards 85 (checklist) to 169 and Series 3 cards 170 (checklist) to 255. 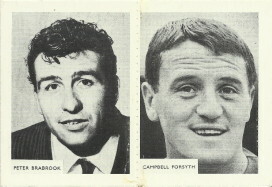 The galleries available for this set include full player appearances for 1970/71 plus team results home and away, with goalscorer. An interesting feature of this set is that it includes 21 of the 22 sides playing in the First Division in 1970/71. 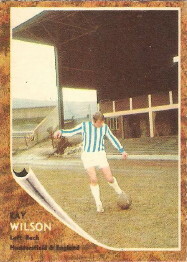 Huddersfield Town, promoted from the Second Division in 1969/70, are not included. An attractive set of 'pin-up' posters issued with Series 1 of the Orange Backs. 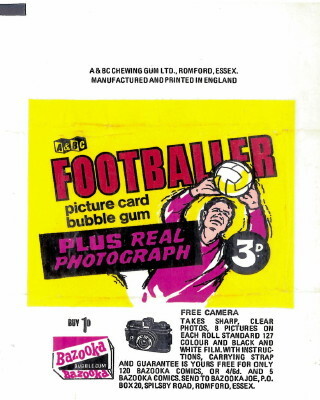 Since these pin-ups were squeezed into the bubble gum packets they always have the creases. Very small stickers which include the instructions 'Peel off back and rub picture with ball point'. Most of these transparencies would have been so attached to school books and other surfaces, so very few have survived intact. 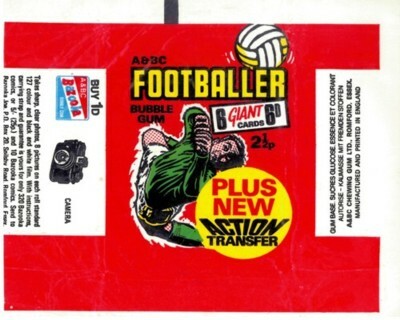 These transfers were issued with Series 2 and 3 of the Orange Backs. A new and interesting design from A&BC. The backs are stylish, but the fronts perhaps don't have the same appeal as in previous years. Series 1 comprises cards 1 to 109 (checklist 57), Series 2 cards 110 to 219 (checklist 170) and Series 3 cards 220 to 290 (checklist 277). 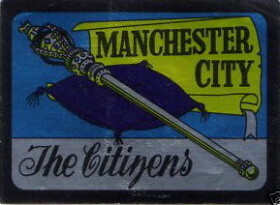 The set includes 23 crests, being the remaining 20 First Division teams from 1970/71, the two teams promoted from the Second Division (Leicester City and Sheffield United), plus Cardiff City who finished 3rd in the Second Division. In the album Cardiff are stuck at the back, with the note 'Always one of the leading clubs in the Second Division, Cardiff narrowly missed promotion last season'. 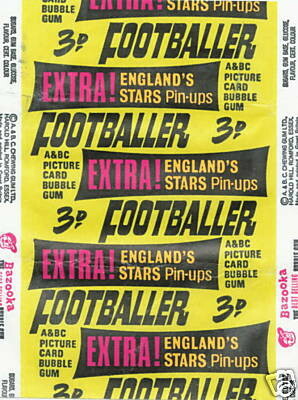 Attractive stickers which were issued with Series 3 of the Purple backs. 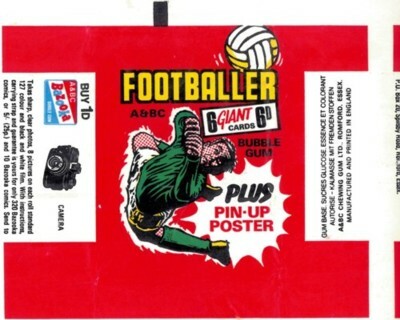 These stickers, like the crests, advertise the A&BC Footballer Album to stick them in. The 23 Superstars are from the 23 clubs featured in the Crests (above). In the album you stuck the Crest and the Superstar alongside the club information. A&BC back to basics with a well-designed set of attractive cards. This set comprises 2 series: cards 1 to 109 (checklist 45), and 110 to 219 (checklist 154). 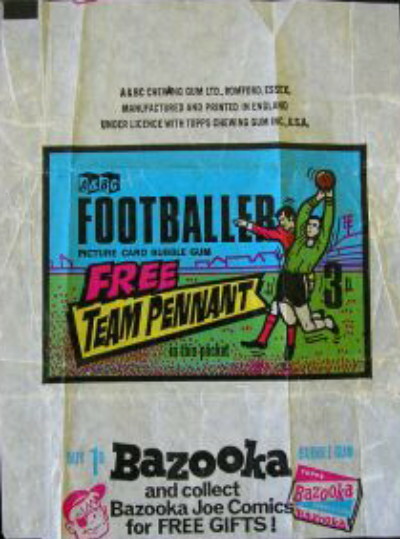 These cards were issued with Series 2 of the 1972/73 Footballer cards, both the English and the Scottish versions. 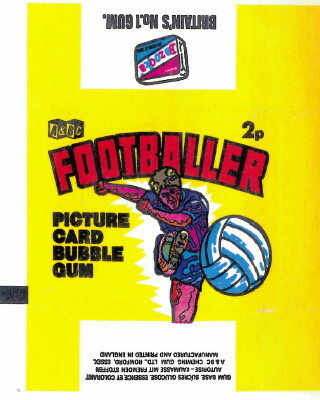 The images on the cards appear identical to the images on the Footballer cards, without the backgrounds. Large posters of the top English and Scottish teams, each with 12 player portraits. 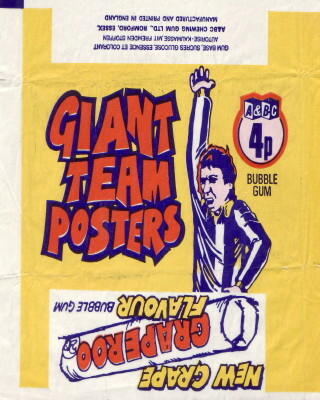 The posters were collectable from packets of gum costing 4p each. The posters have been dated to mid 1972 for production, with the likelihood that they were distributed early in 1973. A&BC entered the era of scary hairstyles with a classy and popular set. The set was issued in 2 series: cards 1 to 131 (checklist 36) and 132 to 264 (checklist 182). Quality control was still not a priority for A&BC with cards 235, 262 and 264 never issued. 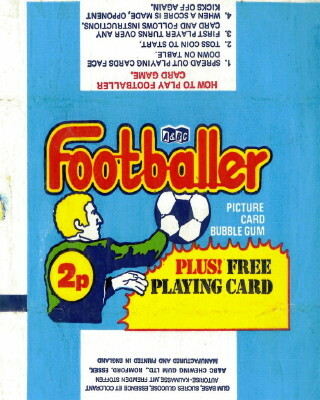 You received 4 cards for 2p. Another A&BC set of black and white photographs, similar to the 1969/70 set but these tend to be action, rather than head, shots. Quality is again an issue, with the paper tending to age and therefore make this set appear older than they really are. 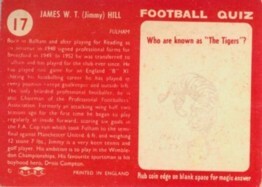 These cards were issued with Series 2 of the Blue back set. 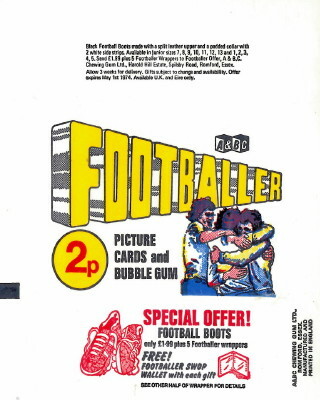 The last ever A&BC Footballers production before the takeover by Topps. A small set, only 132 cards, and no special giveaways. Checklist card is number 13. Gallery: Arsenal, Birmingham City, Burnley, Chelsea, Coventry City, Derby County, Everton, Ipswich Town, Leeds United, Leicester City, Liverpool, Manchester City, Manchester United, Middlesbrough, Newcastle United, Norwich City, Queen's Park Rangers, Sheffield United, Southampton, Stoke City, Tottenham Hotspur, West Ham United, Checklist. 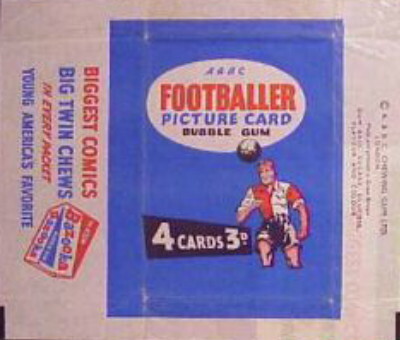 Over the years there has been much speculation amongst collectors about whether or not A&BC ever issued 'Lucky bags', which were, allegedly, paper bags containing an assortment of football cards leftover from previous issues. 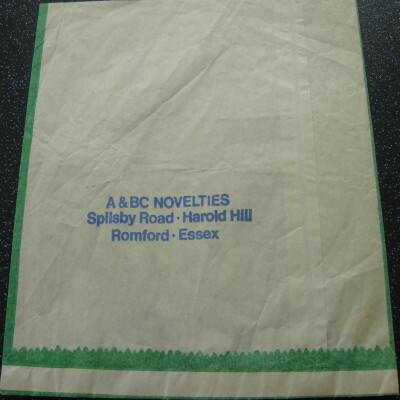 The images shown at right, kindly sent in by a couple of website visitors, are of a paper bag from a previously unknown company called 'A&BC Novelties' albeit from the same address as A&BC Chewing Gum Limited. What these bags contained is not clear, but at least one visitor has confirmed that they included 1974 World Cup souvenir posters (each measuring 6" x 4½"), forming a set of 12. Frustratingly these posters do not include the A&BC name. What is going on here? Well, by this time A&BC had been in dispute with Topps for some time and were heading towards their unfortunate demise late in 1974. The World Cup was held in June/July 1974 so it is not clear what A&BC Novelties were trying to do, or who was running the 'new' company. 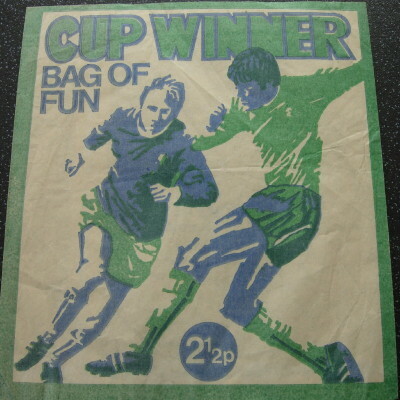 Douglas Coakley does not remember issuing these Cup Winner, Bag of Fun bags, though he does recall 'Lucky Bags' (date unknown). 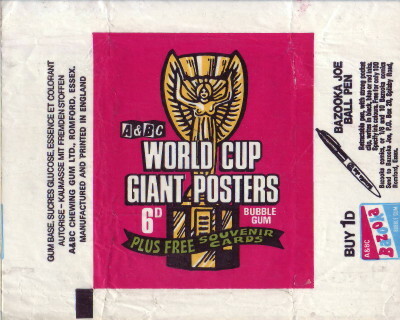 Click for an image gallery of the set of 12 1974 World Cup souvenir poster cards.